The Inuvialuit Smithsonian Project received its initial seed funding from the Intellectual Property Issues in Cultural Heritage project (IPinCH), housed at Simon Fraser University and led by Dr. George Nicholas. Our project team has been interested in exploring questions of access related to the MacFarlane Collection, particularly how greater awareness of and access to the collection can be fostered in the Inuvialuit community. Below is a discussion of intellectual property issues raised by members of the Inuvialuit community during community outreach sessions, which is presented in a Question & Answer format. We welcome feedback and further questions on these issues from Inuvialuit users of this website and other interested individuals. Q: Is there proof that the collection was purchased? A: The correspondence between Mr. MacFarlane and the Smithsonian reveals that MacFarlane relied tremendously on his Inuvialuit associates to acquire objects, including both cultural items and natural history specimens (birds, rocks, fish and mammals), that he sent to the Smithsonian in Washington. MacFarlane had a team of Inuvialuit collectors, as well as individuals from the Anderson River community who brought items in to trade. As MacFarlane and the Inuvialuit were economically linked through the fur trade, they were reimbursed for these items with trade-goods such as clothing, tools, tobacco, guns and ammunition. Q: Were any of the items in the collection re-sold by the Smithsonian? A: As was common practice at the time, a portion of the Inuvialuit material that MacFarlane collected for the Smithsonian (about 170 items) was subsequently exchanged with other museums, who were also working to build their fledgling collections. For the most part these were duplicate items and they were sent to museums as far away as New Zealand and Holland. One of the largest exchanges was to the National Museum of Denmark which received about 40 Inuvialuit items in exchange for a similar collection of objects from Greenland Inuit. Unfortunately, over 50 Inuvialuit artifacts loaned to the Chicago Academy were destroyed in the great Chicago fire of 1871. With time and the realization that the Smithsonian’s ethnographic collections were a priceless and irreplaceable heritage, the practice of exchanging collections was abandoned. Today, items in the collection are often loaned out for short-term exhibitions before returning to the collections-care and conservation facility that houses them. Q: Can the collection by repatriated? A: Under the North American Graves Protection and Repatriation Act (1990), the everyday sort of objects that MacFarlane acquired for the Smithsonian do not come under the category of objects subject to repatriation. The Smithsonian’s policy on repatriation seeks to return “sacred items” and “items of cultural patrimony” as well as any items associated with burial rituals to descendant community members. As best as we can tell, the Inuvialuit collections are composed of day-to-day items from domestic and subsistence contexts that do not have a special “sacred” context. 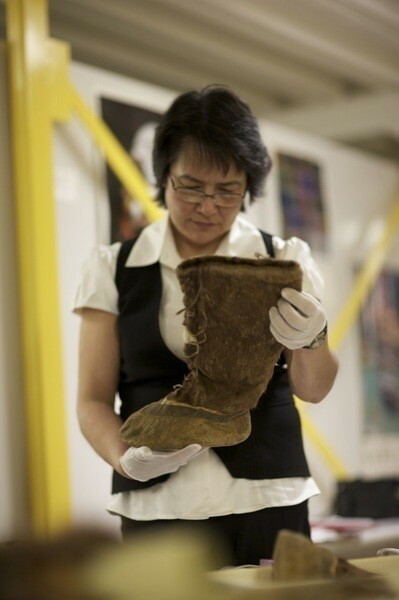 However, it is in the spirit of repatriation that the Inuvialuit Smithsonian Project seeks to figure out ways to make the collections accessible to the communities in the Inuvialuit Settlement Region from which they were derived. Q: Who holds copyright of the clothing patterns (& other objects) produced by the project? A: The Inuvialuit Cultural Resource Centre holds copyright of all knowledge and patterns for objects developed by the Inuvialuit Smithsonian Project. However, we very much welcome seamstresses, tool-makers, students, and other beneficiaries to re-create objects in the collection and share them with us. We would be happy to have you contact us with photos of your re-creations and we will post them to this website.